Port Hueneme, CA – After one of the most action-packed years in its history, Championship Wrestling from Hollywood will bid farewell to 2018 with Milestone! 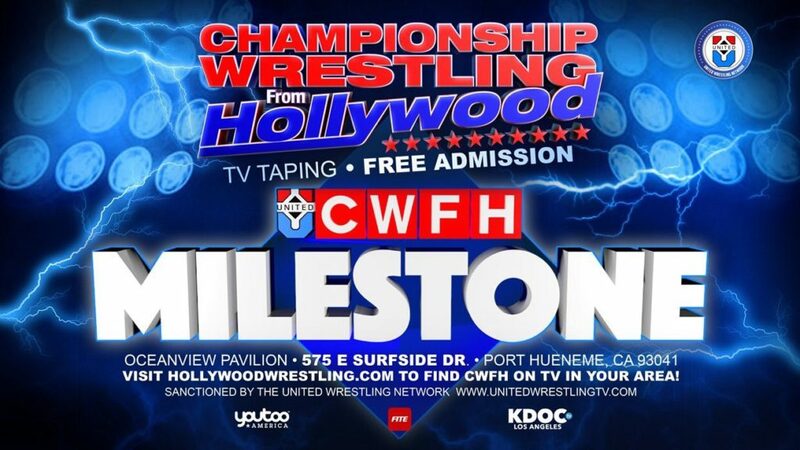 Celebrating eight years of CWFH action, Milestone will once again emanate from the Oceanview Pavilion in Port Hueneme. As always, Milestone will deliver one of the most stacked cards of the year! The annual PP3 Cup Tournament is right around the corner, and nearly all participants have qualified, including the likes of Fidel Bravo and Richie Slade. But one final spot remains! The first 10 men to sign up will enter a Wild Card Battle Royal to determine the final entrant! Heather Monroe has been running roughshod over CWFH’s women’s division, but at Milestone, the powerhouse known as Ayoka Muhara will attempt to shut her up once and for all. This year saw New Japan Pro Wrestling open a brand new Los Angeles dojo, which houses some of the hungriest talent in the state! At Milestone, CWFH fans will see the future, as these Young Lions will be in action. Alex Coughlin and Clark Connors will take on the team of Ray Rosas and Adrian Quest, while Karl Fredericks will go one-on-one with the sadistic Bateman! Suede Thompson shocked CWFH fans when he attacked WATTS from behind, forming an alliance with his once rival, Chris Bey. Bey and Thompson, now collectively known as Double Platinum, will take on WATTS in tag team action, but who will be WATTS’ mystery partner? In one of 2018’s most unlikely developments, Gentleman Jervis and Robert Baines have reformed the Friendship Express! In fact, the pair is so confident in their renewed power that they’ve vowed to vanquish Howdy Price’s Rancheros! “Professional” Peter Avalon has developed quite the rivalry with Tim Storm, most recently losing a humiliating Kiss My Foot Match to “The Perfect Storm” at the NWA’s 70th Anniversary. Avalon is irate, and has demanded Storm face him one on one at Milestone! NWA Worlds Heavyweight Champion Nick Aldis is no stranger to CWFH, and at Milestone, “The National Treasure” will put the Ten Pounds of Gold on the line against Bad Dude Tito! Willie Mack had a phenomenal first defense of his NWA National Title against “Uptown” Andy Brown recently. We now know that Willie will defend his title again at Milestone against the very man that Mack defeated to become the National Champion, Samual Shaw! Speaking of Brown, the “Last of a Dying Breed” has moved mountains for a shot at Royce Isaacs. At Milestone, all bets are off as Brown aims for the Heritage Title in a Ladder Match! Admission to Milestone is FREE, seats are first-come, first-served. For more information, follow CWFH’s social media channels, @CWFHollywood.